1952, 1955. Birds of eastern and north eastern Africa. 1962, 1963. Birds of the southern third of Africa. 1970, 1973. Birds of west central and western Africa. Summary. This is the first handbook of birds of sub-Saharan Africa. 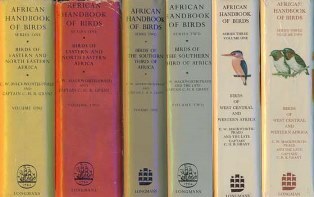 Until the more recent Birds of Africa series was published, this was the only easily available information on birds for many African countries. By modern standards the colour plates and maps are poor and today the text is out of date. A set of black and white photos is included, of birds and/or nests, at the back of each volume. Nevertheless the series is a collector's item, and it is interesting to compare the increase in knowledge for some species, and the lack of knowledge in others. The authors, Cyril Winthrop Mackworth-Praed (1891 - 1974) and Captain Claude Henry Baxter Grant (1878 - 1958), were British ornithologist and collectors. They published much of the systematic side of the work in various ornithological journals. All African weavers were covered, except recent discoveries, namely Malimbus ballmanni (1974), Ploceus ruweti (1982), Ploceus burnieri (1990), although there are many taxonomic changes in other species.